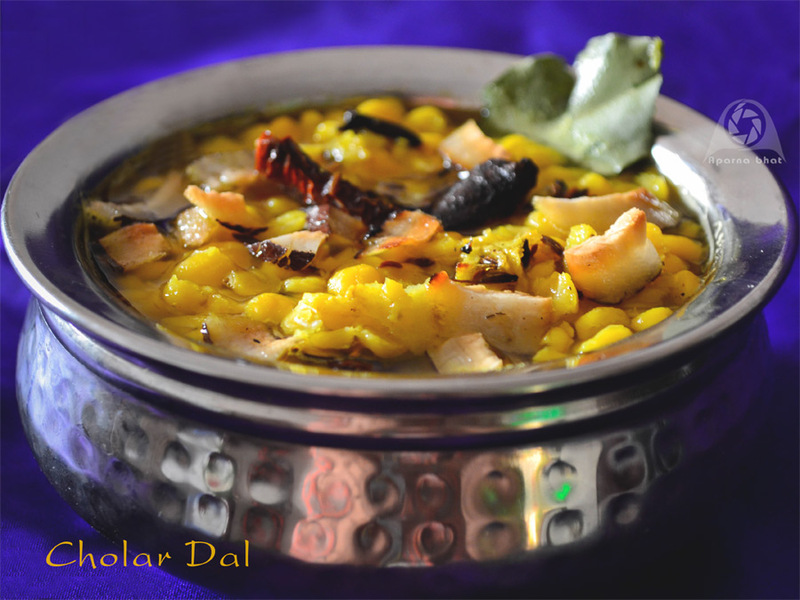 Cholar Dal is a delicious daal preparation with chana dal [Bengal gram]. This slightly sweet, delicately spiced dal is very popular nutritious dish from Bengali Cuisine. It is easy to prepare and made by adding ghee, coconut and mixture of spices. The consistency is thick and bit different from other dals. Kaushi Bhatia, the author of "Favourite dishes of India", mentions the dal to be appetising both in appearance and taste if it is not very watery and if the whole grains of dal are visible. I adapted the recipe from the above mentioned book and have been doing this regularly now as we liked the unique taste of coconut slices in the dal besides the mixture of spices that impart extraordinary flavors to this dal. Wash and soak chana dal in water for an hour. Cook the dal soft either in open pan or pressure cooker. I prefer to cook it in pressure cooker and then transfer it to open pan/vessel. Add sugar, salt and turmeric powder and simmer it till most of the water is absorbed [ few minutes]. Take care that dal should not be overcooked and each grain of dal should be visible. Meanwhile when the dal is on flame, heat 1 1/2 tbsp ghee in a separate pan. Add thin coconut slices and saute them until they are slightly golden brown in color. Take them out and keep it aside. In the same pan, now add bay leaf, cloves, cinnamon piece, cumin seeds, broken red chillies. Saute them until all the spices turn slightly darker and emits a nice aroma. Now add grated ginger, pinch of hing and stir for 30 seconds more. Add this seasoning to the cooked dal. Mix in 1 tbsp of roasted coconut slices too and cover the vessel with a lid. Simmer everything for 3-4 minutes. If you need add a little bit warm water and stir it well to maintain desirable consistency as mentioned above. Switch of the flame, garnish with remaining fried coconut slices. 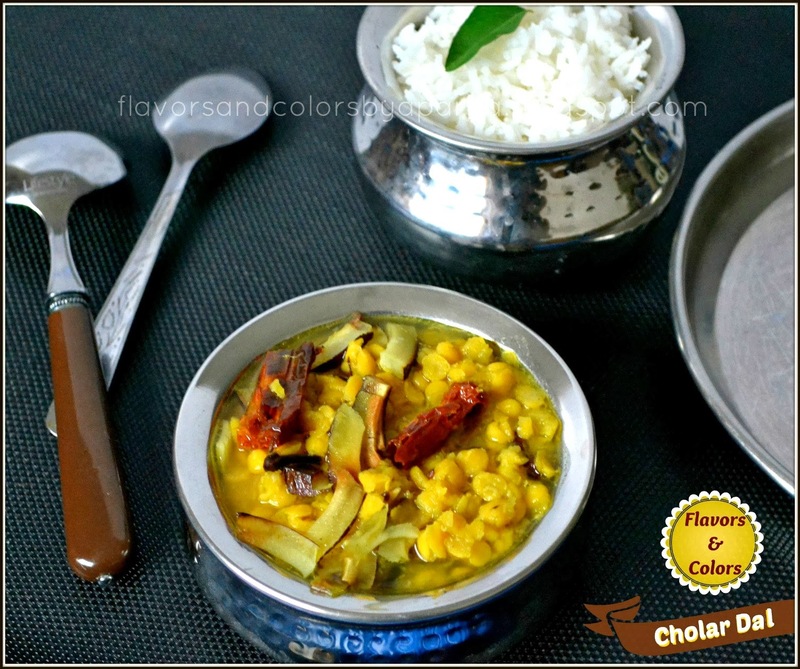 Bengali Cholar Dal is ready to be served hot with rice or chappatis. 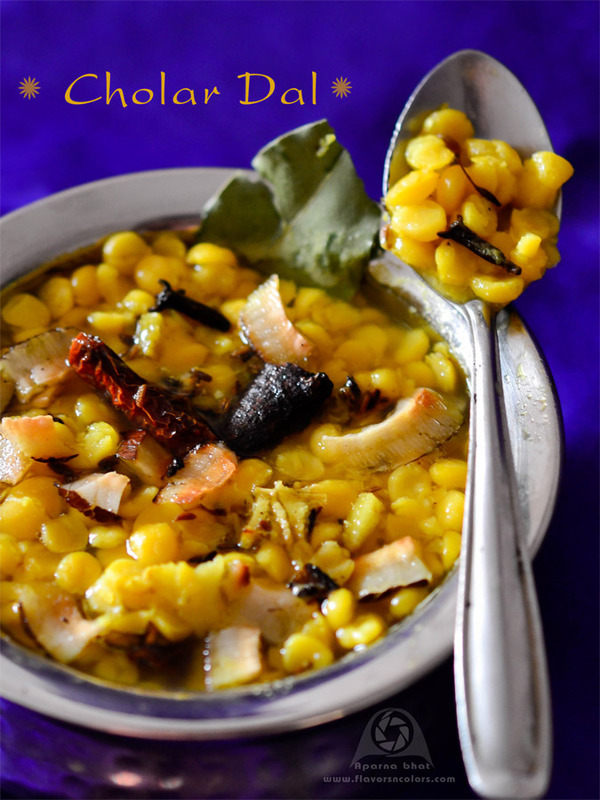 Sending this entry to Flavors of the world, New U "2014.
liked the new look of your blog.. the dal is comforting n exotic.. This dhal looks healthy nad delicious,thanks for sending it to Flavours of the world grande finale event.